One artist I'm ABSOLUTELY obsessed with right now is Ke$ha. When I obsessed, I mean NEED NEW MUSIC NOW. This why I'm scouring YouTube looking for new song clips. I've already fallen in love with her hit single, "Tik Tok," as well has her rumored follow-up single, "Blah, Blah, Blah," featuring 3OH!3. Now I've just heard a clip of "Dinosaur," and OMG. I can hardly contain myself. She kind of sounds like a cross between Lady Gaga and female rapper, Sarai (remember her song "Ladies"?). She brings the electro-hop sound to life and I can't wait for her debut album, which is due out January 5th on RCA Records. You might recognize Ke$ha from her vocals on Flo-Rida's smash "Right Round," but as a solo artist she is really blowin' up. Peaking on the Billboard Hot 100 at #3, the song has gone to the top in several other countries. 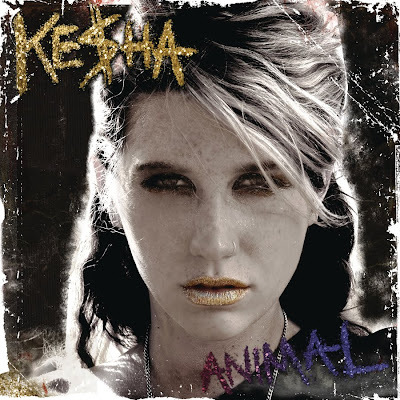 The 14-track album, titled Animal features production from supertalents like Benny Blanco (Ciara), Dr. Luke (Katy Perry), Greg Kurstin (Nelly Furtado) and Tom Neville (Calvin Harris) and songwriting from the likes of Max (Britney Spears), former Amy Winehouse school-mate Neon Hitch, and Ke$ha herself, to name a few. Mark your calendars for this one folks. Pre-order it NOW on iTunes for only $6.99! Oh, and also check Ke$ha on tour with Lilith 2010.